It’s been a while since I’ve posted anything about our wedding, and I promised here to share details on the DIY projects that made the day happen. So, in order to not break promises, today I thought I’d spill the beans on the big focal point of our reception – the streamer backdrop. I was actually inspired to do this pretty late in the game, with only a few months left ’til the wedding. But, this project seemed so simple and inexpensive that I simply couldn’t resist. First, I’ve got to share my inspiration. Rachel’s (of Heart of Light) inspirational backdrop. Click on the photo to be taken to the blog article at 100 Layer Cake featuring her amazing instructions. How beautiful is that?! When I stumbled upon this photo, I was smitten and knew such a simple decoration would fit right in with our backyard reception, while adding some drama. Rachel created this backdrop herself and provided very helpful instructions. Please visit the source article to view those instructions. Rachel also directs folks to Oh Happy Day, where she learned to make fringey streamers. This tutorial was also so helpful. I also found that I LOVED this blog and fell in love with a number of additional articles featured there. I highly recommend stopping by. So, with both tutorials at my fingertips, I got to work. I purchased my crepe paper from crepepaperstore.com per Rachel’s suggestion. The online store had great prices. My husband (or fiance at the time) was tasked with buying wooden dowels from the hardware store. We bought four, 5′ dowels for a total of twenty feet of backdrop. I also bought silver foil curtains from Amazon (it was the same price on Amazon as at Oriental Trading where Rachel made the purchase, but I got free shipping on Amazon). And I already had hot glue gun supplies. 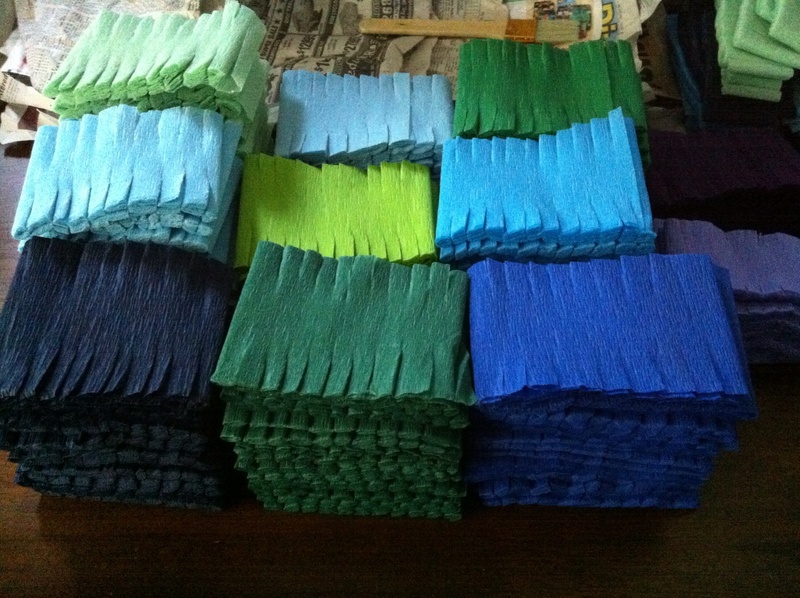 After my supplies were gathered, I arranged my crepe paper and prepped all of my streamers. Then I arranged them by color to make it easier for me to see which colors I wanted to use while I was applying them to the dowels. My crepe paper ready for dowel attachment. I filled one dowel at a time. I completed the first dowel at my home, attached the foil curtain to the back, wrapped it in a sheet and transported it to my sister’s house (the reception site) – all per Rachel’s instructions. When I got to my sister’s, and we unrolled the streamers, we found that the foil backdrop had gotten extremely tangled and it took us quite a while to sort everything out. I was so concerned because everything felt so delicate and I still had three more dowels to complete. Then, my sister had a bright idea – why don’t I put everything together at her house. Then we wouldn’t have to worry about transporting anything. My sister – so smart!! Ricky: Auntie, you’re getting married. Me: Yes, I know. Are you excited for the wedding? Ricky: Yes. And I’m going to look handsome and you’re going to be beautiful… Mommy said so. I think my heart about burst out of my chest at that. But, back to the streamer project. We finished everything on time. When deciding where to hang the dowels we discovered that the foil curtain continued to get tangled up whenever the slightest breeze blew, so I decided not to add anymore of it to the remaining three dowels. My brother-in-law and his dad hung up the streamers the morning of the wedding and it was and is the hit of the party. This backdrop helped create some of my favorite photos caught by our photographer. It served as the backdrop for toasts and the dance floor and over all was the least expensive way to add drama, style, to our wedding celebration. My favorite photo captured by our photographer. 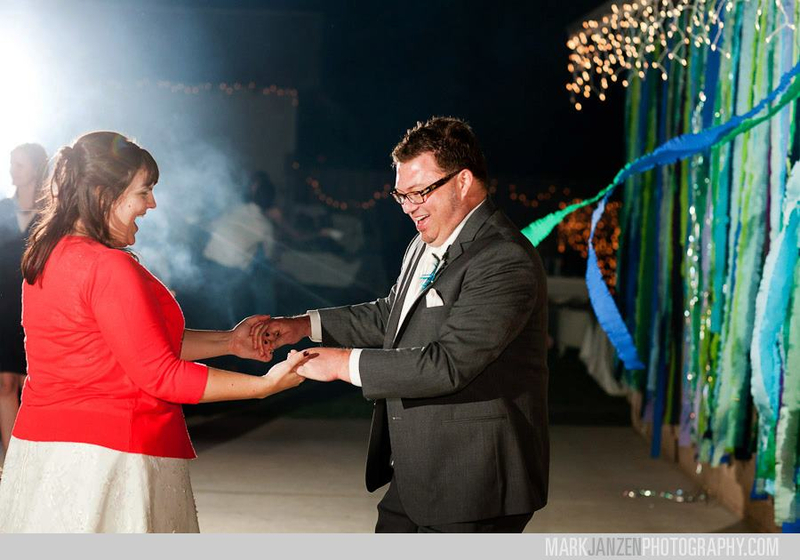 My husband and I dancing up a storm with the streamer backdrop catching a breeze behind us. 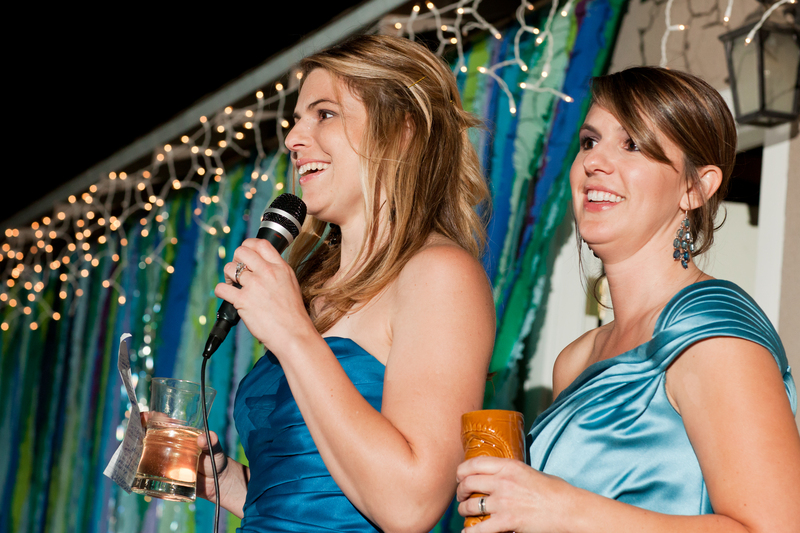 My beautiful sisters, and matrons of honor, making a toast in front of the streamer project. What do you think? 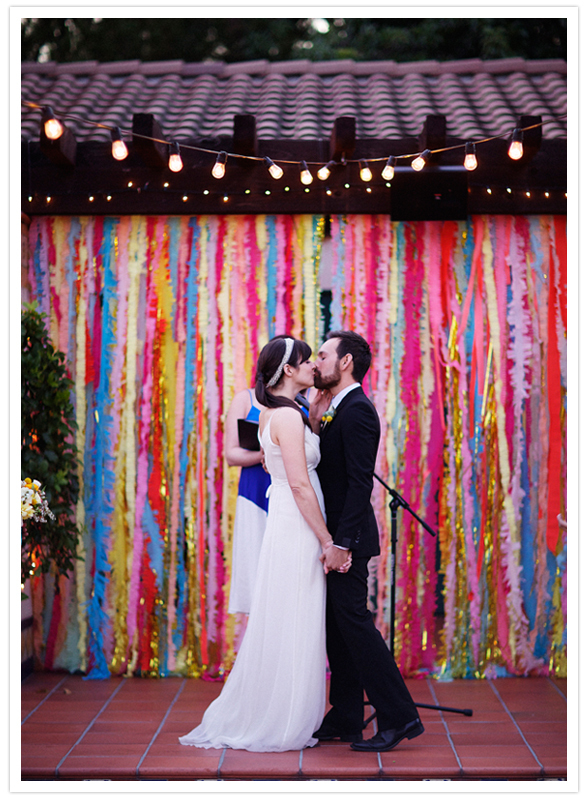 Do you have any similar backdrops that you’ve created for parties or weddings? Yeah, yeah, yeah…I know my post titles need work. I’m sure improvements will come with time. Of course that’s assuming that some of my inherent cheesiness will dissipate with time. We’ll see. Blue has been my favorite color since I was a very young girl. I love many shades of blue, too. I don’t know if I can attribute this love to any one thing – maybe it’s how the color reminds me of my dad’s eyes (as well as my grandpa’s, and now my nephew’s and my fiance’s); or maybe it’s how so many shades of blue are played out in different bodies of water whether it be the ocean, a lake, or a swimming pool – I love them all; or maybe it’s how when I look at something that is blue I instantly feel a state of calm. Regardless, I love the color. Darrin’s favorite color is green. And though he likes blue, he takes issue with certain shades. For instance, navy blue is out of the question for him. 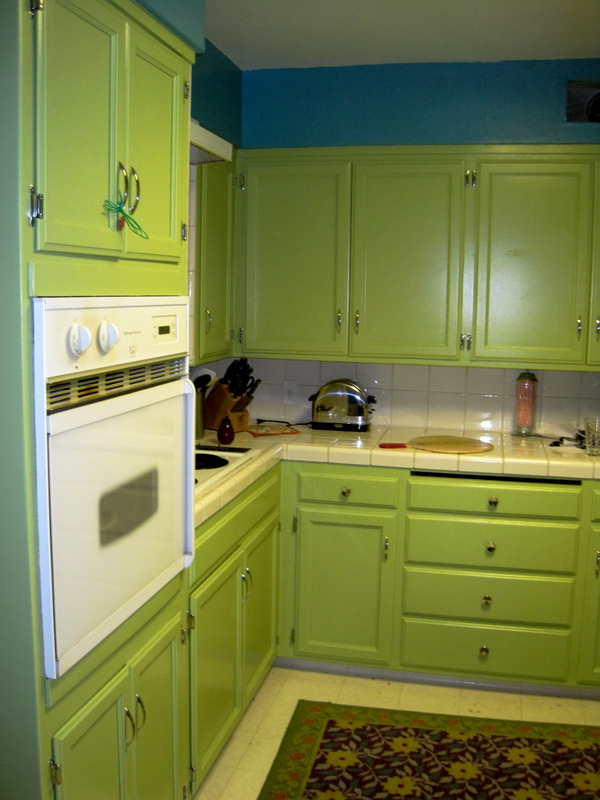 As you can tell from this kitchen cabinet makeover, we’ve already started merging our two favorite colors. So, it’s no surprise that we’ve settled on the two colors for inspiration for our wedding pallette. If you’re keeping tally folks, we’ve actually made another official decision (but still no date). So, now the matter at hand is settling on the shade of blue and green to go with. Here are some photos I’ve been storing on my Pinterest page and mulling over as possible inspiration. Vibrant shades of blue and green pop out from unlikely (and likely) sources – but not always together. A blue door left me drooling at the site, and a green peeking-petticoat (one of my favorite new customs) had me ready to switch sides on the blue/green fence. Forget the wedding! 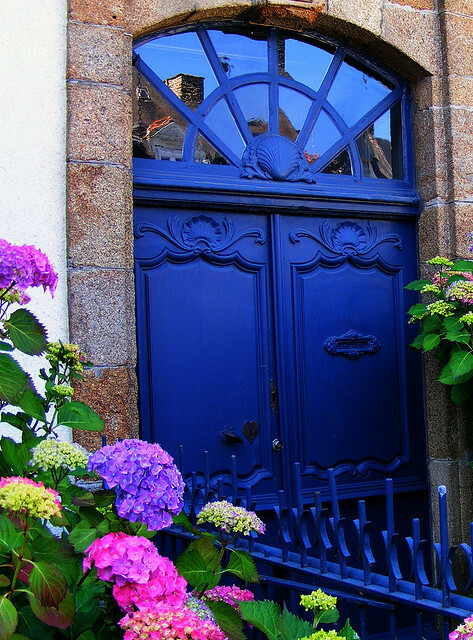 We've got two front doors and they both need this color. Stat! Stat means now! That green knocks me for a loop and makes me question my blue allegiance. Deeper tones of blue and green from a real-life wedding and a painting found on Etsy.com definitely feel right for a fall wedding. Plus how awesome does that grey suit look? Darrin would murder that suit! These deeper tones are perfect for a fall wedding. The blues and greens in this painting go so well together. A foreshadowing of the future to come? For our final look at color inspiration today, we turn to nature. A bouquet of peacock feathers and a grassy cliff overlooking the ocean prove that blue and green are a match made in heaven. Blue and green co-exist happily in nature. Blues and greens near the ocean offer tons of inspiration. So what do you think? How did you pick the colors for your wedding? Or if you’re not married, are there any color combinations you’ve seen that you’re crazy about? Like what you see? Click on each photograph to get to its original source (or at least as close to its original source as I could take you). It is in the spirit of that practice that I’m writing this post. Today, I’m posting about our kitchen. We finished painting the cabinets in this room quite a while ago. But, I feel like I need to add this accomplishment to the top of my list. Just so I have something to check off on the mountain of things to-do in our home. Let’s start at the beginning with some before photos. 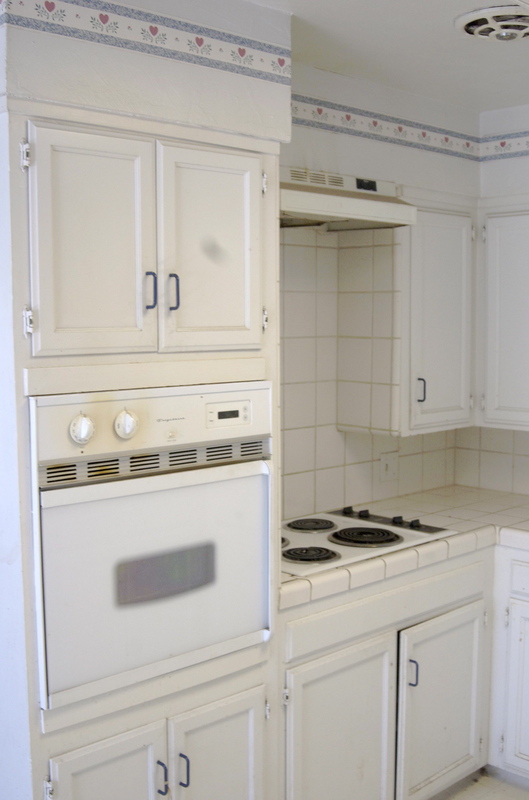 A view of the kitchen before. Be glad we didn't show you the inside of that oven. 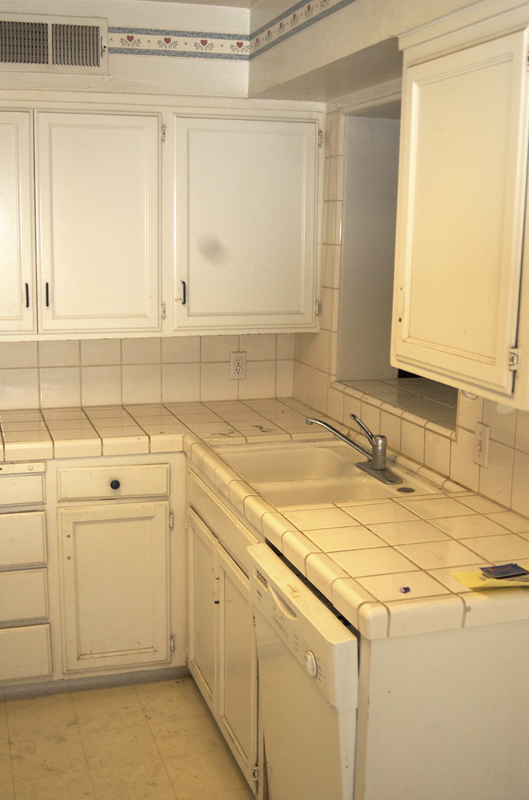 And here’s that same kitchen after we painted. 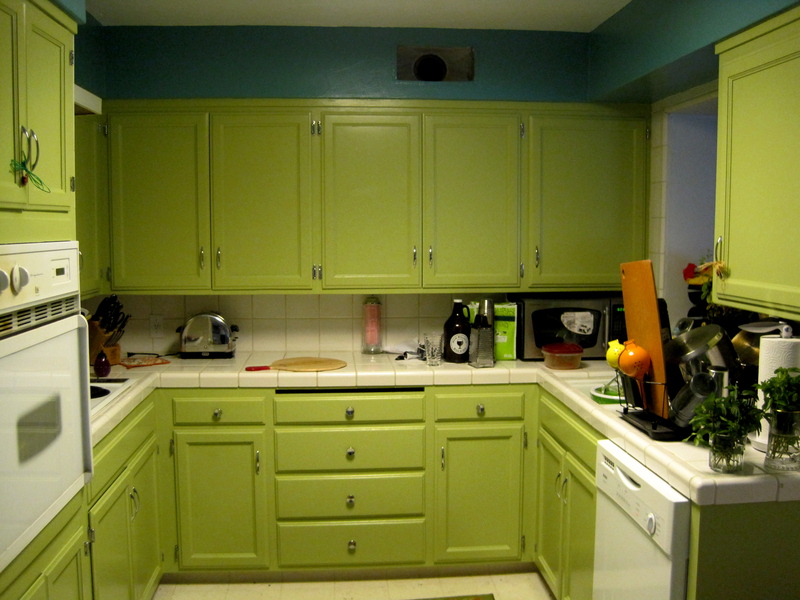 We settled on green for the outside of the cabinets and blue for an accent color. We also painted the inside of the cabinets blue, which is a fun surprise when you open them. We traded out the old hardware for some shiny new chrome ones that felt like they reflected the time period of our kitchen a little better. During the whole process we became quite the contortionists, twisting and bending to paint the undersides of shelves and make sure we got the paint in to the far reaches of every nook and cranny. We took a leap and went with some bold colors. We were so sick of the white walls. And one more before and after. How about that wall paper? We've since rearranged some of the use of the counter space. But we're still so happy with the colors! It feels so good to check this off our list. Makes me want to move on to something else! What about you? How do you go about organizing your things to-do? Do you have any special tricks to get yourself motivated?